We carefully choose the type of polymer to your specific sludge water type – thereby avoiding excess use of polymer. We offer several technologies for sludge water dewatering. The dry matter percentage varies according to the applied technology. Belt filter may be applicable for situations where the desired dry matter is between 8-12%, thereby ”pumpable”. For higher levels of dry matter (25-30%) a screw press will be used. Control panel (not shown in illutration). Dosering pump (placed in tank). The solutions can be delivered as a stationary equipment or as a mobile unit in a trailer. Both are equipped with a control box and designed for easy maintenance. 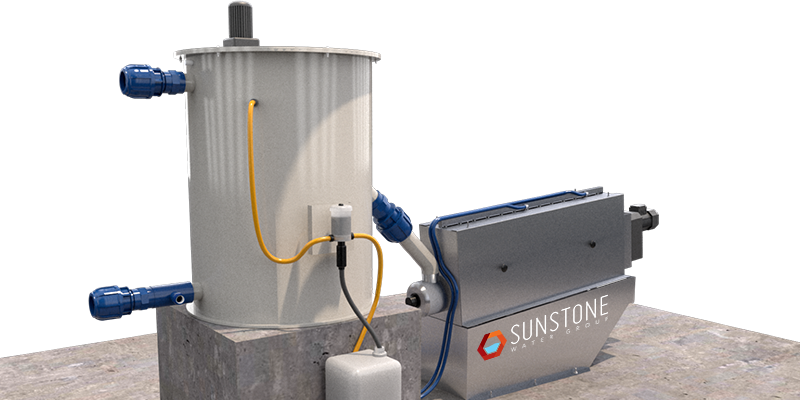 Sunstone’s Sludge Dewatering Unit is optimised and tested for use in land-based fish farms. Sludge dewatering and flocculation is a controlled process of separating sludge for excess water. By increasing the Dry Matter (DM) content of the sludge less volume is required for storage and transport. As such, A Sludge Dewatering Unit is a cost-effective solution for the land-based fish farm. The technology is delivered as a complete system which is easy to operate via a control panel. At the heart of the system is a screw press made in stainless steel. The system has built-in self-cleaning nozzles which minimize dry matter built up on the rotating parts of the machine. Maintaining the machine is limited to thorough rinse after each use to ensure its longevity. Very few interchangeable parts contribute to lower operating costs and easy maintenance. Correct dosing of polymer is done automatically to ensure the most suitable conditions for the thickening process. We offer a site-test to determine the best polymer for your type of sludge. Our standard model is designed for 5 m3/hour, suitable for the modern land-based fish farm. We can also deliver the dewatering unit in various capacities to match your exact needs. Also, the unit produces high quality reject water which can be drained to the lagoons. The sludge thickening and separation unit can be adjusted for limited foot-print in various configurations. We also offer added components including a sludge conveyor belt or a sludge transfer snail, both in stainless steel. Please contact us to learn more about our product range for land-based aquaculture.